Though pianos are one of the largest types of instruments that you might find in someone’s home, they are in fact quite delicate. Without the proper attention, care and tuning, a beautiful piano that was once well cared for could become rather useless to play and impossible to resell. With proper maintenance, though, pianos can last generations. One tricky situation that many piano owners may notice is rust accumulation on the strings. 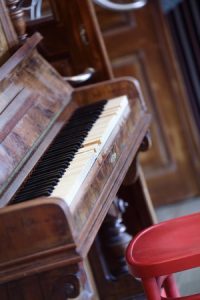 Rust can cause the piano to fall out of tune more quickly, and can even cause wear and eventual breakage of the strings. There are a variety of different opinions out there about whether or not you can remove rust from your own piano strings. Some say that you can polish and remove the rust in your own home, but we recommend having a professional help you out with rust removal. Piano strings can be very delicate and prone to damage, so it’s best not to fuss with the strings if you don’t know what you’re doing. However, one thing you can do in your home is take steps to prevent string rust. Rust occurs on piano strings because of moisture. When the air around a piano is very humid, the condensation of this moisture-filled air on the strings can cause them to rust. Worse, when dust settles on the strings – which it inevitably does – that dust holds the moisture closer against the strings for even longer periods of time. The first thing you can do is try to regulate the temperature and humidity in the room where you keep your piano. Make sure that the temperature stays between around 68 and 78 degrees Fahrenheit, with humidity in the 42 percent to 47 percent range. Fluctuations in temperature and humidity can exacerbate string rust, so keeping conditions as consistent as possible is the best way to prevent rust from forming. You can also purchase a string cover to protect your piano strings from collecting dust. A string cover doesn’t limit you from using your piano, but if you have a baby grand and like to display the strings, it could be a little unsightly. However, the string covers can be taken on and off quite easily, giving you a versatile protection option while affording you the option to show off your prized possession when desired. Lastly, make sure that you regularly dust your strings. While there isn’t a tried and trusted way to remove rust from your strings in your own home, you can definitely get rid of unwanted dust that could eventually lead to rust. We suggest that you use a vacuum cleaner with a powerful reverse suction, to blow the dust off of the strings and into one corner of the piano. Then, simply use the normal suction to remove it. Don’t use the vacuum to attempt to pull the dust directly from the strings, though, as this could easily put undue strain on the strings or even lead to inadvertent contact and breaking. Keep these tips in mind to help prevent rust accumulation on your piano strings, and remember, if you do notice your strings begin to rust, call in the experts – don’t try to polish them by yourself! At East Coast Piano Rebuilding, rust is just one of the issues with your piano that we can help with. To learn more about our services or to schedule an appointment, call us today at 603-887-4489.